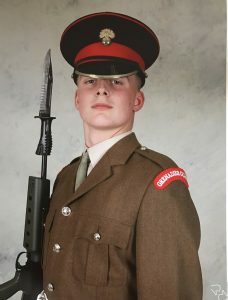 A DYNAMIC duo from Woking are proud to have become part of the most senior regiment of the Guards in the British Army and, at 17, identical twins Alex and Lewis Hazell are two of the youngest in the household division. What better Christmas present for delighted Mum Wendy, who’s a childminder and Dad Lee, a train driver, to see their young sons arrive back home in Westfield on Saturday as Grenadier Guards. The former Woking High School students, who had always been keen cadets, had been accepted on a course at Harrogate Foundation College to complete their Phase 1 training. The pair then went on to pass tough regime of military instruction before graduating from the Phase 2 section at the Infantry Training Centre (ITC) Catterick in Yorkshire. Alex admitted it had been a challenging 18 months, as he told the News & Mail: “I have been pushed to the extremes and learned what my body is truly capable of. At times I thought I would not get through, but I wanted this so much and, with the support and encouragement of my family, I did it. Like his twin, Lewis is happy to have got through the gruelling basic training and is grateful to all the staff for enabling this to happen. 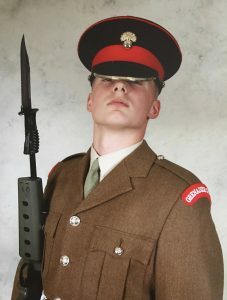 Alex won the accolade of Best Recruit, although the Platoon Commander said it was a difficult decision between the twins as both of them were the best. But there was only one award. Mum Wendy told the News & Mail: “As their parents, Lee and I are so proud of our boys and what they have achieved. They are very happy doing what they love and will serve our country well. As Guardsmen, Lewis and Alex will now serve the country as infantry frontline soldiers. Their first posting will be after Christmas when the pair are due to go to Wellington Barracks to join Nijmagen Company, where they will be largely assigned public duties, state ceremonial events and guardsmen at London’s historic buildings wearing the iconic ceremonial uniform. After building on their training at Wellington Barracks, they will be then based in Aldershot with the 1st Battalion Grenadier Guards.